Having read the previous two novels by Douglas Misquita, I was not expecting anything less than an explosive, bullet riddled, immersive cinematic experience. The Apocalypse Trigger did not fall short of this expectation. The Apocalypse Trigger unfolds a multitude of events and characters over both time and geography which convene at a single focal endpoint. Each event is choreographed in Douglas Misquita's characteristically detailed sketches that envelope the reader into his world. Scene setting, combat sequences, heist and escape scenarios written to place you in the centre of the action, whether you have caught your breath or not. Be ready to be exposed to an arsenal of military weaponry and thrilling scientific innovations which create a backdrop of their own to each chapter. There's even a mix of gore for those who get their kicks from the occasional spray of blood and bone. Having a wide cast of characters playing their own significant role in building the story, the book fails to develop substantial character depth which sadly diminishes the strength of the thread that weaves the individual events together. Characters of the novel, including the chief players of the story, do not shed enough light over their personalities for the reader to empathize with them. Characters appear and disappear through the book leaving the reader without any familiar ground to walk through what could have been a more comprehensible adventure. All in all, a three star rating to a wholesome adventure riveted with action, tech and the good ole apocalyptic plan. I look forward to more from Douglas Misquita who is clearly honing his skills for something big! 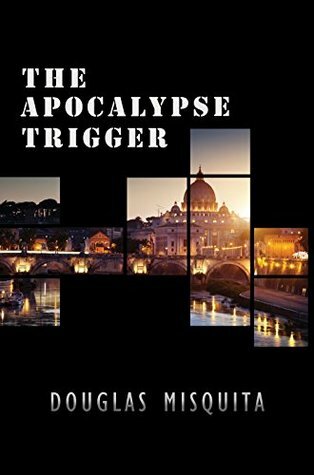 Sign into Goodreads to see if any of your friends have read The Apocalypse Trigger.